Whether you are a novice or a seasoned player, there are always ways to improve your tennis game. These tips will help you get the most out of this fantastic sport. It is important to have the right gear when you play tennis to both improve your game and protect your body from injuries. Be sure you are using the correct size racket: 26” or 27” is best for an adult. Your grip size will measure the length between the lowest horizontal palm crease in your racket hand to the tip of your ring finger. The grip size should be somewhere around 4 inches. Your feet deserve the correct equipment, too! Purchase athletic shoes made for playing tennis with herringbone tread to withstand side-to-side movement. Having a perfect serve is the goal of most tennis players. A lot of your serving success relies on the starting. Hold the ball in your fingertips, not your hand. Never throw the ball more than 3-4 inches above where you make contact with it. Throw the ball in front of you, swinging with a forward motion. Put topspin on the ball as you throw to get a better chance of serving it over the net. The tennis ball will undoubtedly be better controlled as you learn to exaggerate your follow through when you swing. Do not just hit the ball, make a swooping motion with your whole body and continue the racket in that direction another second past when the ball came in contact. Tennis should involve constant movement for your feet. When you hit the ball, never speculate; always get in position and prepare for the return. Oftentimes, tennis players blame their stroke for a mishit when the problem is usually that the player was out of position. One idea to increase your footwork when practicing is to catch tennis balls with your hand against another player instead of receiving with a racket. This drill will force you to move your feet so that you are in the perfect position when receiving a shot on the court. Grab a tennis player slightly better than you and get out to play! Practice on one skill each time you get out on the court until you master it. 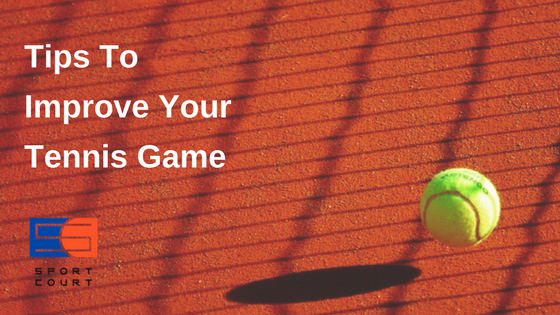 With these tips in mind, you will soon improve your tennis game drastically.